or "We should have gone to Glasgow"
"Spend £5 at Boots and get a free rail ticket!" The offer looked a good idea - buy one ticket and get one free, so having duly spent a fiver (home brew!) Steve and I began to wonder where to go. "How about Glasgow" I suggested. "Can we do it in a day?" "I wondered about the Middlesbrough area -perhaps go out to Saltburn, then spend a bit of time around Thornaby - see all those freights moving in and out of Tees Yard" replied Steve. Sure enough, the platform indicators began to show the Newcastle train as running late - 15 minutes, then 35, then 40. It finally arrived exactly an hour late, at 0958! The explanation given on the train was that "a preceding train had failed, in the Gloucester area". We never did quite find the real answer. One condition of the Boots offer is that you must reserve seats, if that is possible. Our "facing" seats turned out to be "back" - doubtless due to reversal at Gloucester. A lady joining the train with us looked in vain for her reserved seat on the 0958 to Newcastle - she had checked that it was the Newcastle train, and that it was the right coach, but had not expected it to be the previous train! During our long wait at New Street, another announcement explained that a train originating in the north-east would be subject to delay, due to a fatality on the line between Sheffield and Doncaster. We were not too surprised when, on approaching Sheffield, the guard began a check to advise passengers that we would not be calling at Doncaster. In fact we travelled by the route used by north east - south west trains in earlier days, via Pontefract Baghill. It is a shorter route, but subject to many speed restrictions, so we were a few minutes further down on arrival at York. I had hoped for something exceptional on the famous "racing ground" to Darlington, but we never improved on 29 seconds to the mile, and this only after Pilmoor. A double amber north of Northallerton became a single amber and finally a red, and we came to a stand on the Yorkshire -Durham border, the bridge over the Tees just to the south of Darlington. The guard informed us that a preceding freight train was "being inspected" and that we would be delayed for five to ten minutes. True to his word, we moved off again in about ten minutes, passing a 47-hauled train of tank wagons in a loop just to the south of the station. So we arrived in Darlington at 1252, about an hour and a quarter late, our plans for the day now subject to some revision. "There’s a Saltburn train at 1253 - it should still be in…" A quick sprint (trot?) down the platform revealed that it was in fact "in" - a "Pacer" class 142 unit, so we jumped on and found a seat. 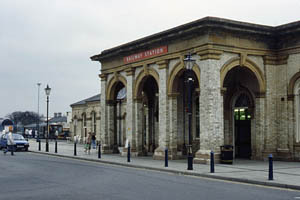 Like most of the route from Darlington to Middlesbrough, the Saltburn branch was built and operated by the Stockton & Darlington Railway, before it became part of the North Eastern Railway in 1863.1 had travelled over part of the route as a child in the late 1950s, on visits to the seaside - Redcar of all places. The journey from Middlesbrough to Redcar might have been on another planet, so different was it from my usual rural existence. The blast furnaces, coke ovens, and "chimneys with flames coming out of them" were a fantastic sight to a six-year old -I wondered how they would look today? Much of the route is now surrounded by what might best be described as desolation, though the South Bank and Lackenby works still revealed active coke ovens and other pyrotechnic activities. Presumably they were what I remembered so vividly. Certainly there is still considerable rail traffic associated with steel making on Teesside. Redcar Station retains a fine overall roof, though the platform covered by it is no longer used. It appeared to be undergoing some restoration for further, non-railway, use. We finally arrived at Saltburn at about 2 o'clock, after what seemed rather a slow journey. Our speed from Redcar did not feel as though it had exceeded 30mph, while the suspension had been giving us an extremely lively ride since leaving Darlington. On arrival the platform announcer apologised for the 13 minutes late departure of the next train to Darlington - the return working of our train. It seemed that our entire journey had been fated! "I said we should have gone to Glasgow"
Time-honoured tradition in these situations is a pint of the local ale, but first to the serious side of business - a photograph or two. One interesting feature of Saltburn station was the through platform running into the Zetland Hotel, originally built and owned by the railway. The course of this remains clearly visible, and though the trackbed has been filled in to platform level, the platform itself remains, as does the canopy over the platform at the back of the Hotel. Mr Price also insisted that we had to check out the Saltburn Miniature Railway. This was actually closed and dismantled a good few years ago, but has been reconstructed and re-opened by a local group of enthusiasts. It was closed until next season, of course, on this cold October day. I couldn't help mentioning to Steve that I had in fact travelled on this "rare mileage" many years ago. And so to the Tetley's! Suitably refreshed, we joined a class 143 pacer, which made clear to us just how poorly the earlier unit had been running. In next to no time we were at Thornaby, where we would see lots of freight workings into or out of Tees Yard, Steve insisted. We had passed a couple of interesting looking trains in the "Pacer"; however an hour on the end of the platform gave us a solitary class 60-hauled stone train, presumably from the Wensleydale branch, and several light engines. The light, poor all day, was of course by now about a week at f2. In my early teens I frequently cycled the 12 miles or so out to the east coast main line, at Pilmoor. I would eventually depart when it had "gone quiet", and would always hear something interesting just as I had cycled out of sight of the line. Within minutes of leaving Thornaby, another interesting looking freight passed us on its way to the yard, and yet another as we approached Darlington. Fate now smiled on us for a little while - the sky cleared, giving just enough light for a few shots of the 91s on the main line before sunset made that impossible. "Getting cold now. How about a coffee?" We had plenty of time for coffee. We were due to catch the 1806 back to New Street. It was shown as "On time" on the TV screens, but eventually arrived 18 minutes late. Gradually we made up time, but for some inexplicable reason, after leaving Tamworth, we took the left fork at Kingsbury Junction, to run round the back of Hams Hall power station via Whitacre Junction, rejoining the main line at Water Orton. As a result we were about half an hour late at New Street, and had missed a potential connection back to Shrewsbury. A local train meant we could at least get back to Wolverhampton, where I had to leave Steve to his own devices (there would be another Shrewsbury train in about half an hour).